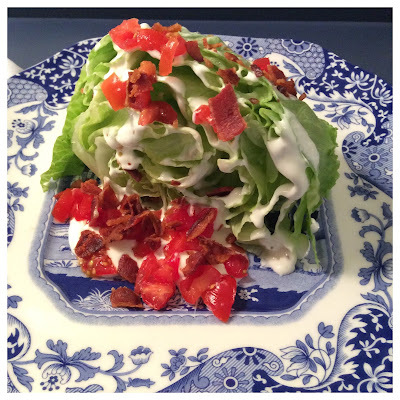 I love the classic BLT Salad*. Today I prepared one with low fat dressing and low sodium bacon....it was delicious y'all! 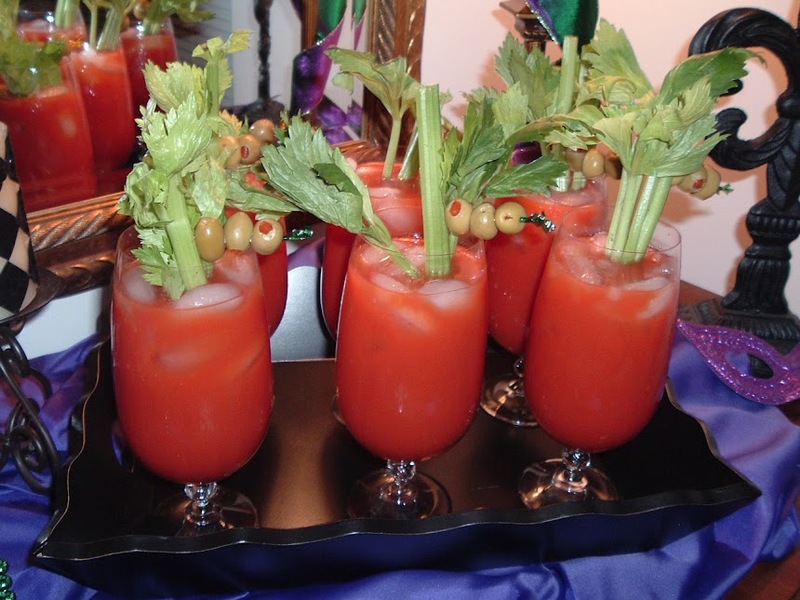 It has lettuce and tomatoes, so that makes it a little bit healthy! 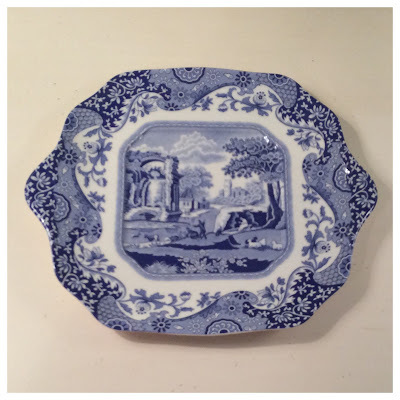 I prepared it on a Spode Blue Italian English bread and butter plate, 11" in diameter and available at Wayfair. This bread and butter plate is meant to be a service plate for a bread loaf. 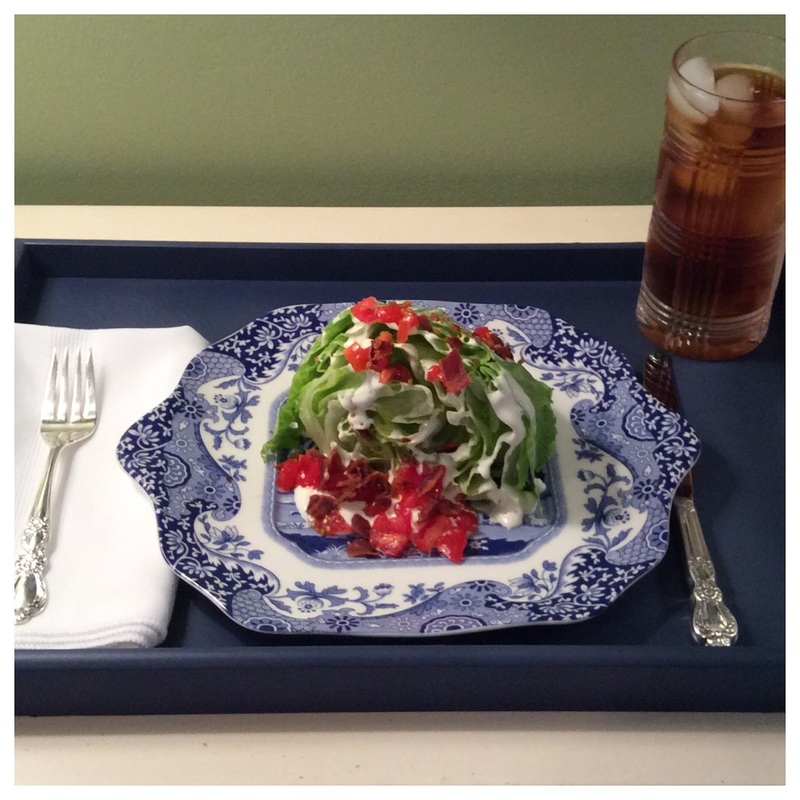 I love it as a salad plate...just the right size and pretty, too! This is the Spode Blue Italian salad plate, 7 1/2" diameter and available at Replacements, Ltd.
Pour the dressing over the lettuce wedge and sprinkle with the chopped bacon and tomatoes. 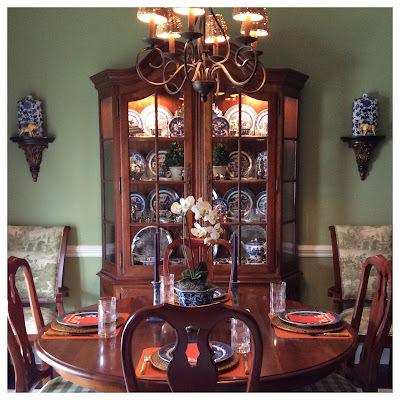 Are China Cabinets Out of Style? I grew up in a home with a china cabinet displaying Mama's pretty china and glassware. Since the day I was married and had my own home, I have always had a china cabinet. But now I'm wondering...Are they out of style? Are they "little old lady looking?" Years ago when I worked in the Bridal Department at Dillard's, I notice very few brides-to-be registered for fine china/glassware/flatware. They were more interested in the high-end kitchen gadgets. 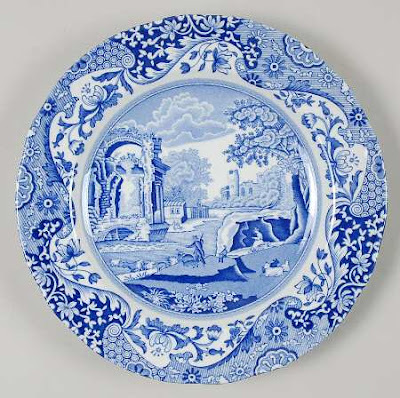 I can also remember many, many years ago when you could go into the china department at stores and see tablescapes of couples' china, glassware, and flatware. 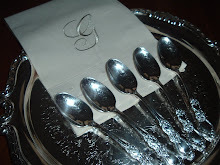 There was always a place card with the name and date of their wedding. 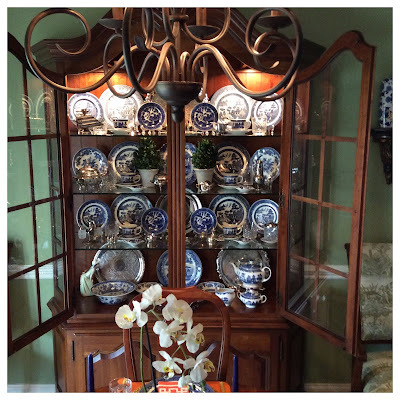 Well, even if fine china is not the must-have gift of couples today, the china cabinet is still a great piece to display your silver, porcelain figurines, books, and other collectibles. 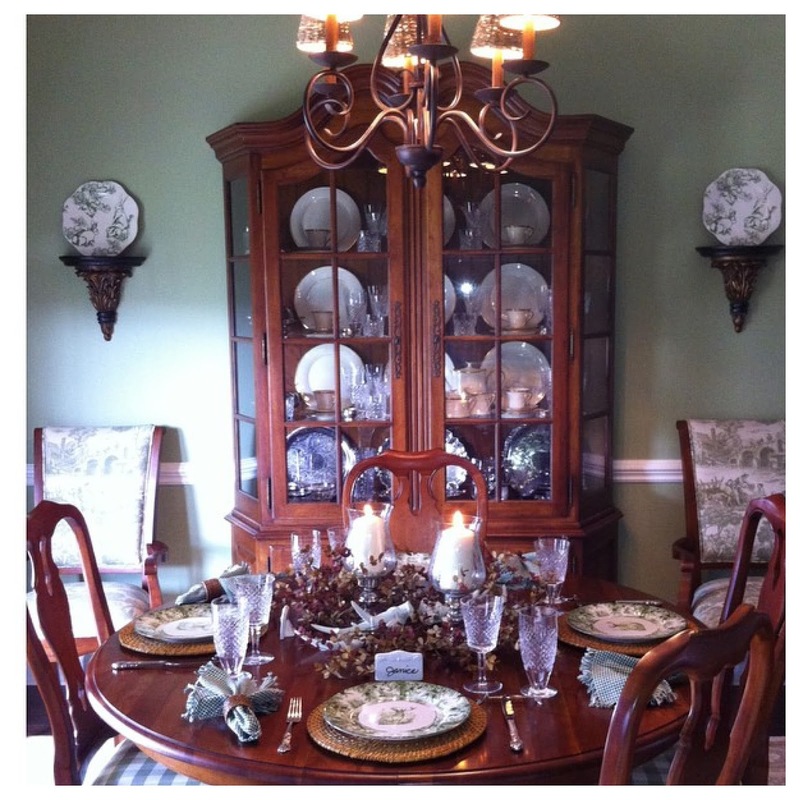 I bought this 'Maison' china cabinet and buffet from Ethan Allen several years ago and totally loved it then. Although I still love the style, I wish I had gone with the gardenia wood instead of the darker wood. But anyway...I usually keep my Lenox 'Eternal' china and Waterford 'Alana' glassware on display, but I do like to change it up every now and then. I switched it up a couple of weeks ago and added my blue and white china. I think it adds a bit more color to the cabinet. I also keep my tea accoutrements in the cabinet with the blue and white tea service. 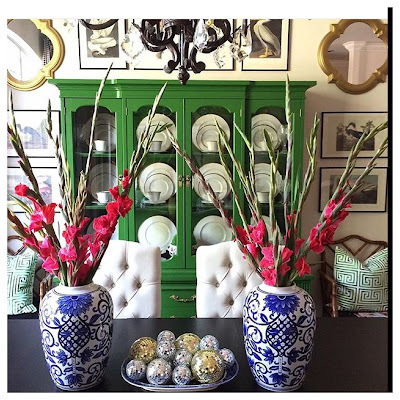 These are a few of my favorite china cabinets I've seen on Instagram...I would love to paint mine, but I just don't have the nerve. I LOVE this one painted a vibrant color of green. How cute is this cabinet painted pink?! Tempting...very tempting! 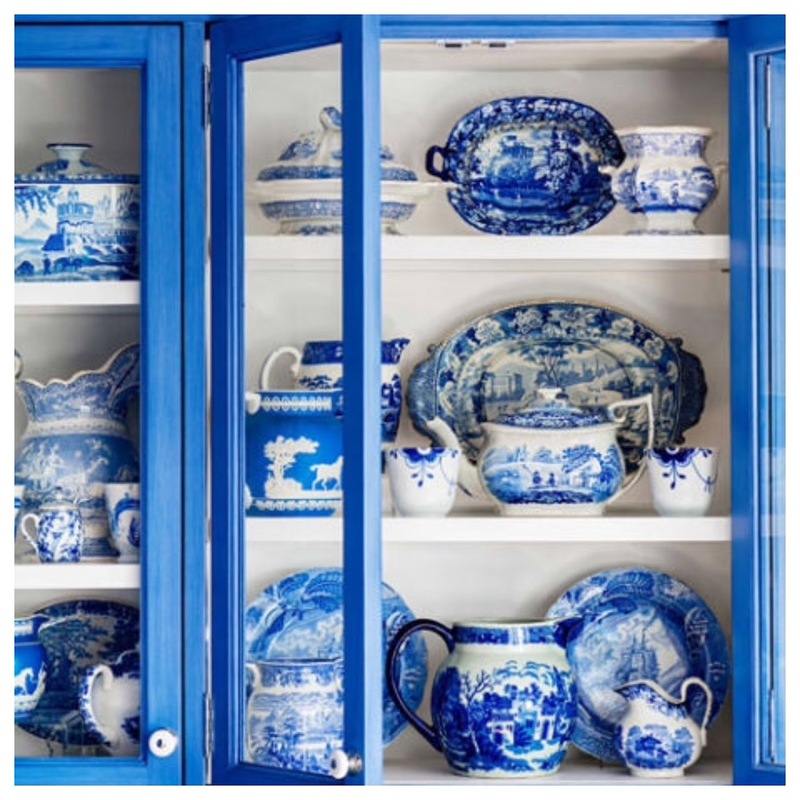 This blue cabinet is the perfect place to display blue and white dinnerware! I got my love of china from my Mama. We both have a ridiculous collection of china and since I live close to her now, I can store my excess at her house! Just curious, did you register for china before you were married and do you have a china cabinet? 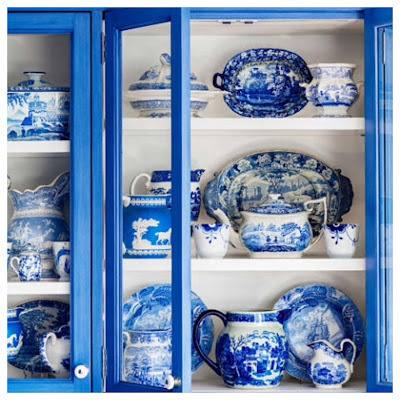 Do you think china cabinets are out of style? Being a huge pageant fan, I'm still on a high from the Miss America Pageant last Sunday night. 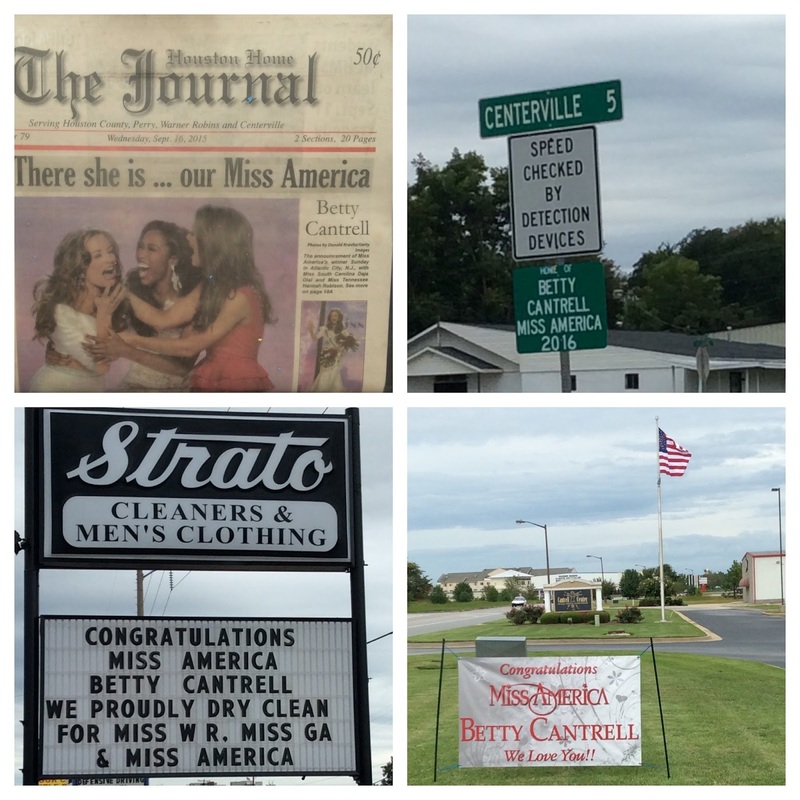 Congratulations to Betty Cantrell on winning the crown! The $50,000 scholarship prize will go a long way in helping Betty to finish her college education and go on to pursue her dream of performing on Broadway! I saw Betty compete at the Miss Warner Robins pageant last year and knew that she was destined to win at the National level. She is a beautiful girl and her talent is beyond fabulous. My town of Warner Robins, Georgia is so proud of Betty and rightfully so. 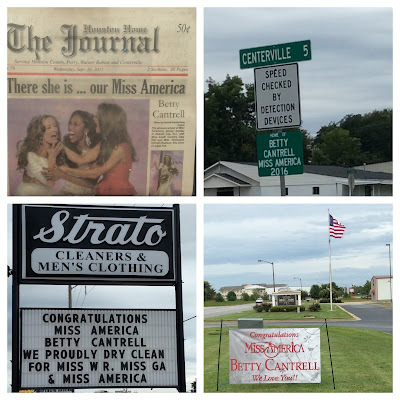 I mean, what are the odds of having a Miss America from your town? My husband estimates that the odds to be 1 in approximately 18,000! Not since 1958 has a Miss Georgia won the crown, back when Neva Jane Langley--from the next county over (Bibb) brought home the title. So yes, Houston County is excited and you can tell from the newspaper covers and signs all over town. 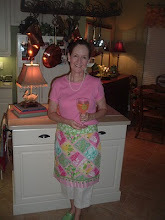 I was happy to see four of my Top Five picks make it to the finals (GA, LA, SC, TN), along with AL, CO, and MS.
"Healthy Children, Strong America" is Betty's platform and you can tell that she has been eating right and working out...she looked fabulous in her bathing suit. Lord have mercy, I have no idea how those girls prance around on the stage wearing those shoes! Can we talk about Betty's talent gown? Take her stunning red gown, add a gorgeous necklace and perfect hairdo, then pair that with her voice...a goose bump inducing opera performance of Tu Tu Piccolo Iddio, from Made Butterfly. It was hands down THE best performance of the evening. Betty, I'm in love with this song and your performance! Now there has been a lot of controversy about Betty's crop-top evening gown. I have to say that when contestants began wearing these several years ago, I was not a fan. But they are popular and I have grown to love them. Betty was not the first Miss America to wear a two piece evening gown. Deidre Downs, Miss America 2005 wore a crop top and looked stunning also! I think Betty rocked her gown. With a figure like hers, she can wear anything and look great! Betty looking very happy the morning after the pageant at the annual toe dip in the Atlantic Ocean...surely she was on a natural high! Congratulations and good luck during your reign Miss America! The 95th Miss America pageant is this Sunday and the winner will be crowned by Miss America 2015, Kira Kazantsev during the live ABC broadcast from Atlantic City, 9-11pm. Chris Harrison and Brooke Burke-Charvet will be the hosts for the evening. Vanessa Williams will return to the Miss America stage as a Head Judge! Remember her Miss America reign? In 1983 she became the first African-American woman crowned Miss America. 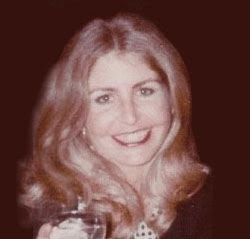 Seven weeks before the end of her reign, a scandal arose when Penthouse magazine bought and published unauthorized photos of Miss Williams. She relinquished her title and was succeeded by the first runner-up, Suzette Charles. Vanessa Williams then launched a career as an entertainer, earning multiple Grammy, Emmy, and Tony Award nominations. There just might be drama y'all, so you don't want to miss it! Vanessa was beautiful in 1983 and is just as beautiful 32 years later. So, who will win the coveted crown this year? It's a weekend full of football games and my favorite pageant ever. Good luck to all the contestants! Mary, we are long-time friends on Instagram, Twitter, and Facebook. 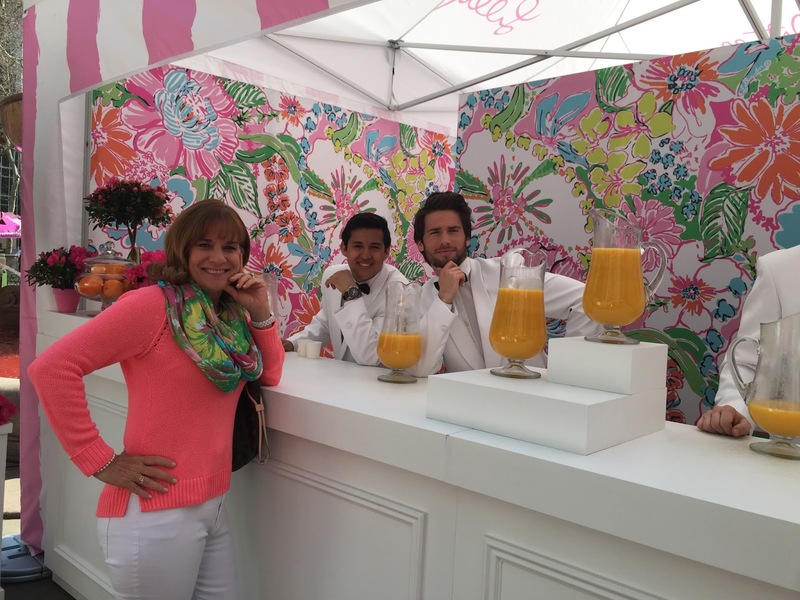 I totally admit that I covet your colorful Lilly wardrobe and it seems that you wear Lilly every single day! Is that true? 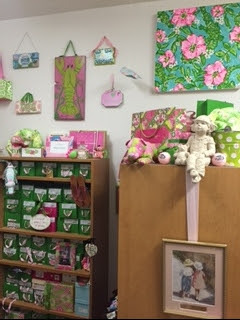 Yes, it is true - I wear Lilly every day. 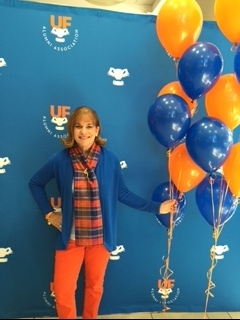 The only exceptions are when I have an event at the University of Florida and need to don my orange and blue. 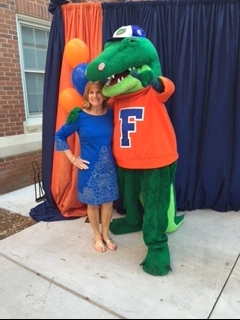 Luckily, Lilly makes a lot of Gator blue that I can accent with orange. Do you plan your outfits in advance or do you just walk inside your closet and put one together on the spot? Would you share with my readers your all-time favorite Lilly possession?This is a tough question as there are many. 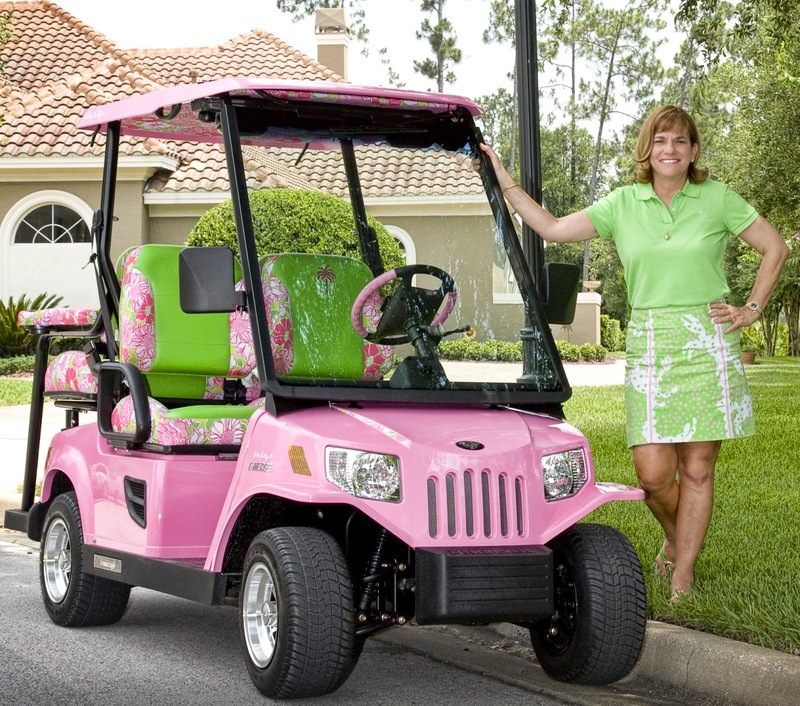 The Lilly item that I use the most is my Lilly Pulitzer low speed vehicle that is street legal (golf cart). It is just too much fun! My dog, Lilly loves to go riding in it. I especially enjoy picking up to go food with curbside delivery and when they ask what kind of vehicle you will be arriving in, I answer a pink and green golf cart. Love, love, love Mary's Lilly Pulitzer golf bag! 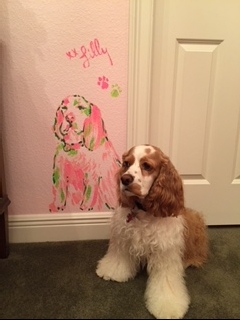 How fabulous is the Lilly artwork painted in one of Mary's guestrooms?! Mary's sweet pup Lilly was even remembered! Some of the most treasured Lilly possessions are the friends that I have made through Lilly. Many of them are lifelong friends that I just adore. I can think of no other brand that has brought so many people together--a special sorority of sorts. 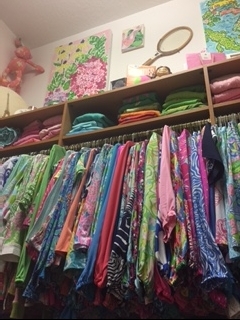 Is there by chance a Lilly piece that got away from you…one that even the “Lady with the most Lilly” is still in search of?I love all of the older Lilly pieces and there were several items from the white label that I do not have. Believe it or not, there was a time when there were not corporate stores and online shopping was not available. One item that I never could find was a pink and green striped cashmere hoodie that was adorable. 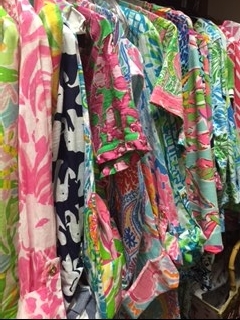 If you had to choose one, which is your favorite Lilly season…Resort, Spring, Summer, or Fall?Oh, I love them all! I never met a collection that I did not like. Do you shop for LP at Lilly stores and Lilly’s online site exclusively?I mostly shop at Lilly corporate stores and I am a fixture in the Winter Park store. One of the things on my bucket list is to visit them all. This is becoming a challenge as they are opening so many stores now. I also shop online too. 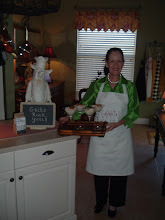 When I am traveling and there is a signature store in the area, I will stop in for a visit. Each store has its own unique personality and decor which is fun to see. When I am in the North East, I enjoy visiting the In the Pink stores. When at the University of Florida, I like to stop in and see the girls at the Pink Narcissus and of course, when in Palm Beach, no trip is complete without a trip to C Orrico. 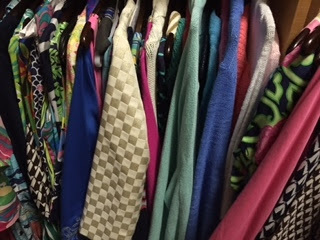 Do you keep an inventory of your Lilly possessions?I really should and I used to keep a list but I have not kept up with this. I do keep all of the Look Books and catalogs and mark the items that I have. 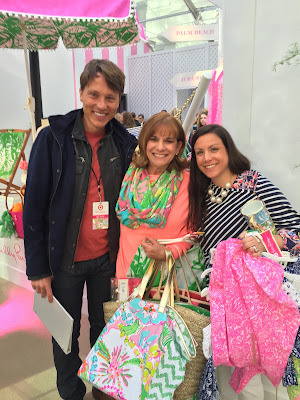 Did you shop the “Lilly for Target” sale and what are your feelings about that collaboration? The excitement over the Target collection was just too much to bear so I hopped on a plane and went the launch in Bryant Park in NYC. 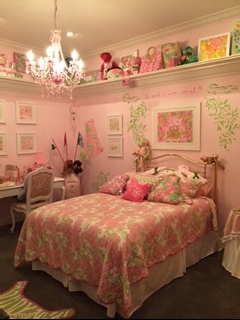 It was fabulous and in pure Lilly style. My hotel room had a balcony that overlooked Bryant Park and I woke up several times throughout the night to see if a line was forming yet. Heather and I were one of the first in line that wrapped around the block and had so much fun shopping the event. To our dismay, you could only purchase 5 items and they were not selling the hammocks or beach umbrellas. We did manage to get some great items. The launch was so successful in that it sold out in the afternoon, well before the slated time to close. The view from Mary's room of the Lilly for Target launch. LOVE the Lilly for Target shopping bags! The launch party in Bryant Park was complete with a juice stand and handsome waiters serving orange juice. 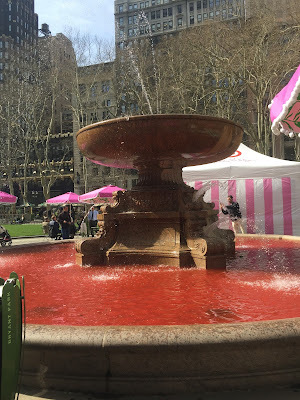 The water in the fountain was dyed pink, there were hammocks and beach chairs everywhere as Lilly models strolled through the park in "Lilly for Target" fashions. The Lilly artists were on hand painting, manicurists were polishing nails in "Lilly for Target" polish and you could play a game of ping pong on a custom painted table. I never wanted to leave as it was a perfect spring day. 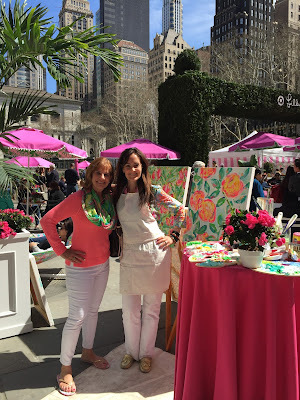 Mary with a Lilly artist...in my next life I'm coming back as a Lilly artists! Before the launch party, I was confident that the line for Target would have quality products. I mean after all, Lilly's name was on it. 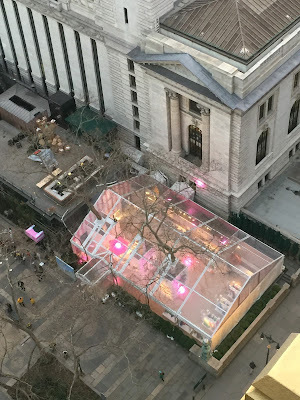 I was even more impressed when I actually got to see everything in Bryant Park. 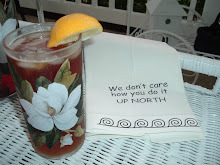 The home goods were a brilliant idea as these were items that the Lilly stores probably did not have the space to merchandise. The fashions were designed so that they could still be chic but more affordable. 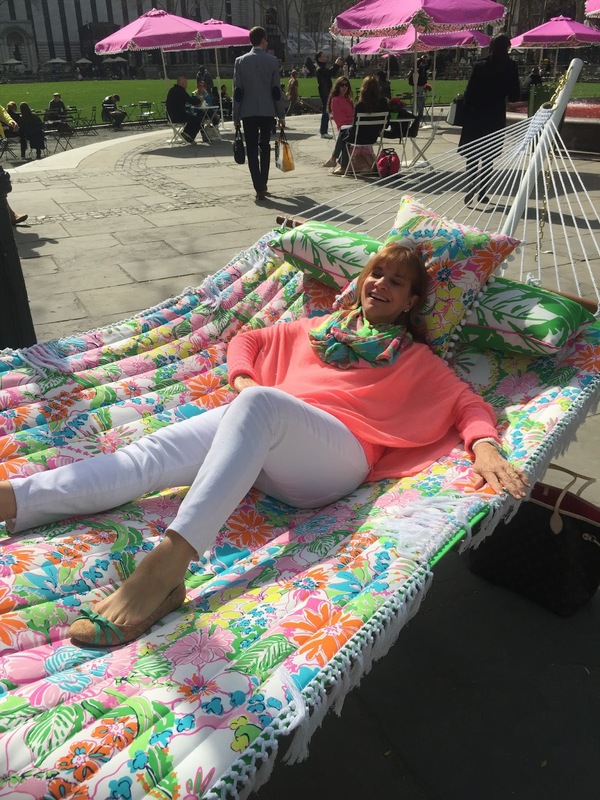 Mary relaxing in style on the coveted Lilly for Target hammock. With all of the excitement at the launch party in NYC, I knew the online sale and the sale in the stores would be huge! I had to have the hammock and umbrella, so I actually pulled an all nighter. I had my blanket and pillow in my study alongside of my computer, phone, and iPad. Facebook friends were chatting and giving each other tips. Friends were texting one another in the wee hours of the morning. By about 5 am, I had secured the elusive hammock and beach umbrella. There was just enough time to shower and get dressed to line up for the opening of the Target store. Once again, there was a strategy and Team Lilly was in line. We all had our assignments and within 10 minutes there was nothing left in the store. We did score a few items that each wanted. Overall, I think the collaboration with Target was a great idea. It was an opportunity to introduce Lilly to those that may have not been familiar with the brand or able to purchase Lilly in their local area. It gave some the chance to own their first Lilly and hopefully created a lot of new Lilly Lovers. 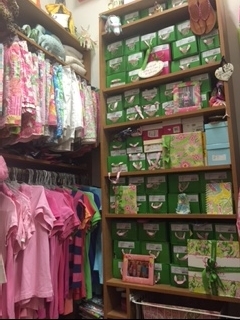 Will you share photos of your closet full of Lillys? 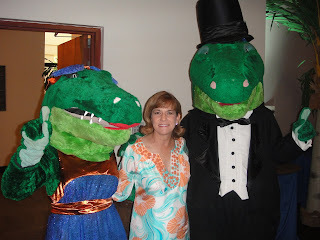 Football season is upon us and I know you are a huge Florida Gators fan. Would you share your favorite Gameday outfit? For most of the games, I am fortunate to be in a suite so I can dress up for the game. 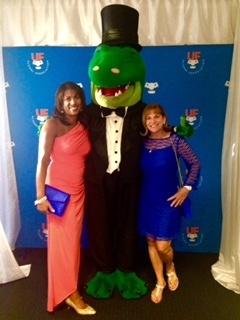 I am usually in an orange and blue dress with a pair of Gator Jack Rogers to complete the attire. 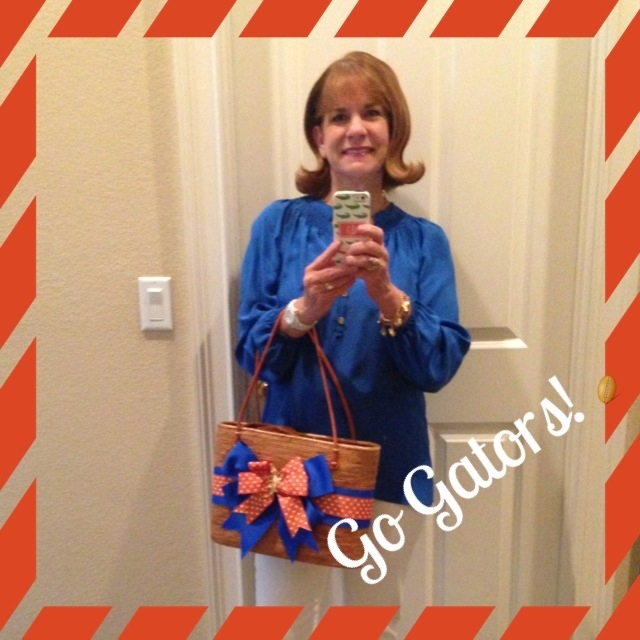 How great is it that this year, Lilly made a gator cuff, earrings, and necklace! These will be great accessories for Gameday. Mary is a Lilly-loving Gator! 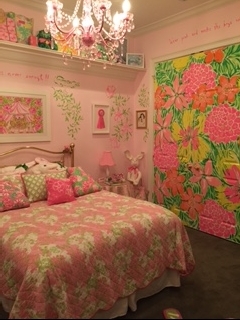 If you know, how many Lilly Pulitzer pieces do you own? (Don’t be shy! 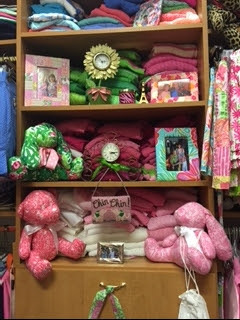 )I have never counted how many pieces of Lilly that I own as it just keeps growing. Plus, if I counted and knew the answer, it might scare me. I would guess there are several thousand pieces in my collection. Do you ever sell or donate pieces from your collection? I have never sold any pieces from my collection as I just cannot part with them. Maybe one day I will but not now. 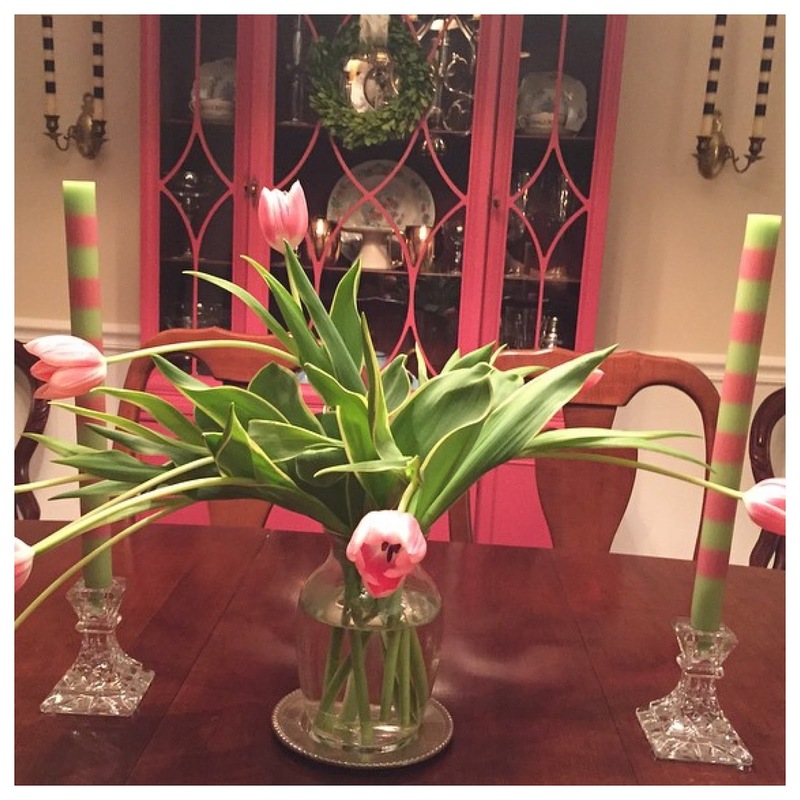 Thank you so much Mary for sharing your pink and green Lilly world with us. Social media is so much fun...it's a great way to peek inside the lives of those who represent what you love. 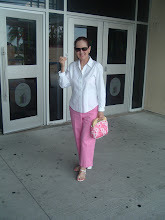 Mary posts photos daily of her outfits of the day. Even though I would love to have her wardrobe, never once have I felt that she overshares or is bragging about all the Lilly that she has. It is fun watching her jet here and there and sharing bits of her colorful life with her followers. Follow Mary on Instagram to see her fabulous wardrobe. 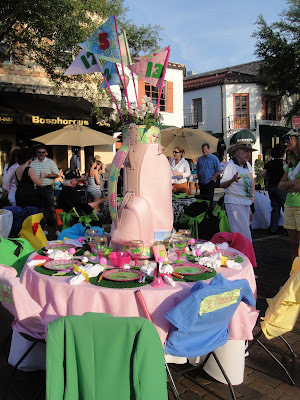 The Official Preppy Handbook Turns 35!